"Oh, do you feel the breeze from the subway?" The Seven Year Itch was a taboo-busting film in the late 1950s. It literally stated in the production code that no jokes about adultery could not be made in movies. The American Theater of that era was somewhat less censored and successful plays with mature themes were quickly made into horribly bowdlerized films. Tennessee Williams' A Streetcar Named Desire and Cat On A Hot Tin Roof were both film sensations that were severely sanitized versions of the original plays. It is ironic that without the restrictions of content, these movies and plays would not be able to push up against those edges in presenting the risqué material to thrill the audience. We see this in our current era, as the walls of censorship have fallen, that movie-makers must go farther and farther to create sensational material. Writer George Axelrod had these extra-heavy restrictions of the 1950s to work against and was able to use witty dialog and off-color situations to amuse and titillate the audience in the stage version of The Seven Year Itch. The play had a long and successful run on Broadway and even though it seemed a sure smash hit on the big screen, many studios passed on it because of potential production code problems. The biggest issue was that the story dealt with a humorous look at...adultery. This was a spelled out no-no for American movies. Richard Sherman (Tom Ewell) has sent his wife and child off to Maine for the summer and now finds himself fantasizing about the potential things he could get himself into as a "summer bachelor". Suddenly, he is faced with the reality of a woman known only as the Girl (Marilyn Monroe), an aspiring actress who has sublet the apartment upstairs. Richard bumbles through a fog of fantasy, battling between his own loyalty to his wife and his natural desire for the beauty upstairs. Tom Ewell is frozen in cinema time in one of THE most famous scenes in film history as he watches the skirt of the Girl billowing up as she stands astride the subway grate on a New York street. The filming of this scene was an international sensation as thousands, including Marilyn's then husband, baseball great Joe DiMaggio, gathered to watch. Film legend has Marilyn causing the need for take after take (a common difficulty in her performances) and repeating the need to blow her skirts up again and again. This infuriated DiMaggio and led to disagreement between the two and ultimately divorce after only nine months of marriage—before this movie was even completed. Ironically, the footage from that night was never used and the scene had to be recreated in the studio. The Seven Year Itch is rooted in its time and serves as almost a museum piece describing a bygone era. Beneath the rigid social standards of those times we can see the cracks that are forming. This is due to the sly adaptation of the play and the intelligent direction of Billy Wilder. Wilder helmed many films that crossed swords with the rigidity of content standards like The Lost Weekend (alcoholism), Sunset Blvd. (the dark side of Hollywood) and Irma La Douce (prostitution). Wilder was nominated for 20 Academy® Awards in his career for writing and directing. However, he was not recognized for this project; amazingly, The Seven Year Itch did not get a single nomination! This film contains another one of the essential Marilyn Monroe performances that defines what made her such a unique and memorable screen presence. Her charm and sensuality is palpable and electrifies the screen. Her execution of the seemingly dumb blonde who knows a lot more than she lets on is perfectly delightful. Many greater films have had much less impact on our popular culture than The Seven Year Itch. The icon that is Marilyn Monroe lives and breathes, perfectly preserved in this performance. Sometimes, our icons don't live up to their legends when we actually examination the work on which their reputations are built. Happily, our respect for Marilyn as a movie star of the first rank is only enhanced here. Image Transfer Review: The restoration and transfer of the films in The Diamond Collection are consistently amazing. The Seven Year Itch is, however, a revelation. Anyone who has seen this film on video and on TV really has no idea what they have been missing. Gone are the yellowish, grainy, squeezed scenes and in their place are crisp, colorful, beautifully composed frames. There are few flaws, but in the Restoration Comparison, it is described and shown what a challenge restoration of this film was. Really, a fantastic job and it is simply a pleasure to watch this, finally, in an anamorphic widescreen presentation. Audio Transfer Review: The sound is Dolby 3.0 Surround, stereo and mono. All three are very satisfactory. The content of The Seven Year Itch is mostly conversation of one type or another. One thing that has marked The Diamond Collection is the fine job done in mapping the characters in the stereo spectrum to their position in the visual frame. It really is very much like seeing and hearing the film for the first time. 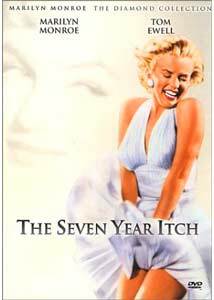 Extras Review: The Seven Year Itch contains the best set of extras in The Diamond Collection. There is the original theatrical trailer and the Spanish trailer which make for an interesting comparison. We have a short Movietone News (00m:30s) which gives us The Seven Year Itch has a "Sneak" Preview, showing a luminous Marilyn arriving for the preview of the film on the arm of Joe DiMaggio. Also included is a fine Back Story: The Seven Year Itch from AMC that tells the imminently fascinating story of the production of this film. Plus, there are even two deleted scenes: I won't say anything to ruin anyone's enjoyment, except that the deleted parts are slight but telling. Additionally, there are four promo sheets that perhaps say more about the horror of 1950s graphic design than anything else. These are the kind of extras that make special DVD collections a pleasure to own. There is no doubt that The Seven Year Itch is a worthy addition to any DVD collection. The production values, the writing and the performances all add up to classic film entertainment. For fans of la Monroe—run, don't walk!